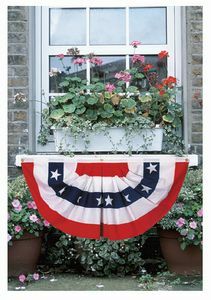 This 1 1/2'x3' printed, polycotton mini-fan flag has five stripes with stars. This pleated mini-fan comes with brass grommets and is ready for hanging. Mini-fan flag is 100% made in the U.S.A.